Although recruited out of high school to play defense, Webb was shifted to offensive tackle and was an All-Southwest Conference selection in 1989. 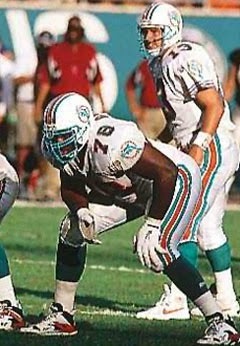 He was chosen by the Dolphins in the first round (ninth overall) of the 1990 NFL draft. The team needed to retool the offensive line and Webb stepped directly into the starting lineup, not missing an offensive down during the regular season. Dolphins went 12-4 to finish second in the AFC East and qualify as a Wild Card team in the postseason while giving up the fewest sacks in the NFL (16). Won AFC Wild Card playoff over Kansas City Chiefs (17-16). Lost AFC Divisional playoff to Buffalo Bills (44-34). Webb was named to seven straight Pro Bowls and was also a consensus first-team All-NFL selection in 1992 and ’94, receiving first- or second-team recognition in two other seasons. While it was argued that he lacked the consistency of his rookie season, he was an outstanding pass blocker who protected star QB Dan Marino’s blind side from the left tackle position and had notable success against division-rival Buffalo’s star DE Bruce Smith. After missing two games due to injury in 1991, he didn’t miss another until seven years later, in 1998. With his skills declining from a Pro Bowl level, Webb still was a capable starter and played his last two seasons with the Bengals in 2001 and ’02. An abortive attempt to return to the Dolphins in 2003 ended with his eventual retirement. Overall, Webb played 13 seasons that included a total of 184 regular season games, all but one of which he started.